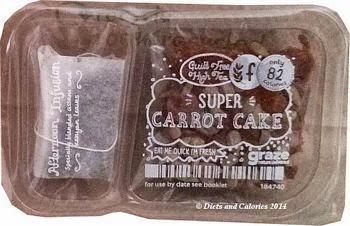 I was happy to find another one of Graze’s Afternoon ‘Guilt Free’ High Tea cakes in my Graze snack box. 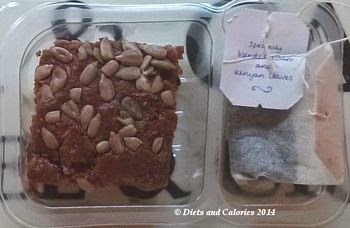 This week it was a Carrot Cake with afternoon tea infusion. Carrot cake is one of the first cakes I ever made. I couldn’t believe that a cake could be made from vegetables, let alone that it could taste so delicious. But vegetables or not, like most cakes they are high in calories. This is where the Graze snacks are so welcome. They provide just enough to allow you to enjoy a slice of decadence without worrying about the calories or going back for another slice. This version of carrot cake is very soft and moist. There’s no icing on top like some carrot cakes have. Instead there’s a generous sprinkling of crunchy sunflower seeds. You can see shredded carrot in there and as well as plenty of dried fruit. I really liked the taste of the cake itself. However, I’m not a fan of sultanas, raisins or currants (I always pick them out of cereal etc). So biting into the juicy raisins kind of spoiled it for me. 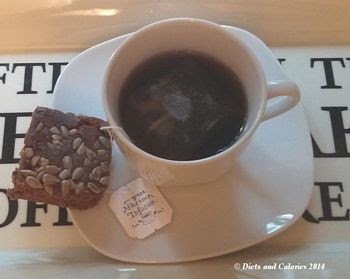 The tea was another infusion of Assam, Kenyan and Earl Grey which made a pleasant change from my regular PG Tips. Other afternoon tea reviews are the Lemon Poppy Cake with 81 calories (reviewed here). I’ve given this a rating of LIKE. Carrot cake: soft light brown sugar, grated carrot (22%), plain wheat flour, rapeseed oil, free range egg, apple fibre, sunflower seeds, sultanas, currants, raisins, salt, bicarbonate of soda, mixed peel (orange and lemon), cinnamon.